I have a profound love of "B" things: baking, Jane Bowles, books, Balenciaga, bees, Cecil Beaton, Bunnys (both Mellon and Williams) and baptism. Growing up in the South, people often wear their religion on their sleeves, and being surrounded by it on a constant level tends to leave you either repulsed or fascinated. I have a profound fascination. I love street preachers, snake handlers, prophetic painters, church architecture, and baptism. As a child, my family lived in a series of houses beside a lake. 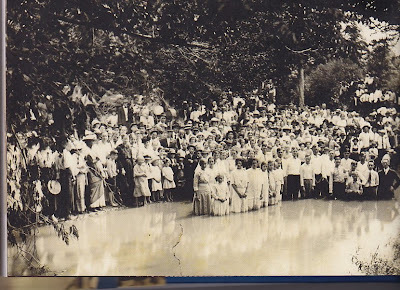 My great-uncle Knox, named for the theologian John Knox, would often allow the small country churches in the area to bring their congregations to the lake to preform immersion baptisms. I would stand in the window of my house and watch as preacher and congregants waded into the water and were pushed below the surface to be born again. 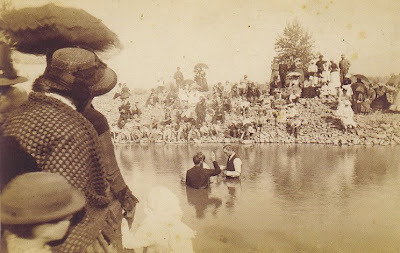 I regret that I have no photographs of those baptisms. If you read my blogs you may also realize that I love music. Recently, Dust-to -Digital produced a book/CD that was made for me. 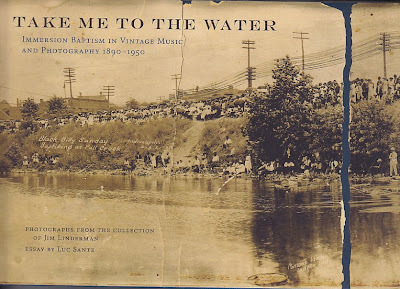 Take Me To The Water features a collection of immersion baptism photographs from the collection of Jim Linderman and a CD of rare folk and gospel recordings from 1924-1940, recorded from original 78 rpm records. Dust-to Digital is the recording label from the rabidly tenacious and encyclopedic mind of Lance Ledbetter. Ledbetter spent 5 years searching for old gospel recordings before compiling his first collection, Goodbye Babylon, a six-CD set that became a must have for anyone interested in religion, early music or Southern heritage. The CD were packed in a wooden crate complete with a 200-page book and bit of raw cotton. No only is Dust-to-Digital concerned with the preservation of music that may soon be lost to us, but their sense of design is impeccable. While the old-fashioned music of the Deep South might not be to your liking, check out the offering of Dust-to-Digital for their sheer brilliance of design. If you want to feel a bit washed in the blood, listen to Reverend Nathan Smith's Burning Bush Sunday School Pupils sing Baptism At Burning Bush. And please, please, purchase something, anything from the Dust-to-Digital. This is one small business that makes the world a better place. Since the holiday season is approaching, might I recommend Where Will You Be Christmas Day? L, you are a genius. I know my mother-in-law would like something from D-to-D. She grew up in a shape note-singing congregation, so I'm thinking about getting her Dinner on the Grounds, too. May I add another Bunny to your collection?